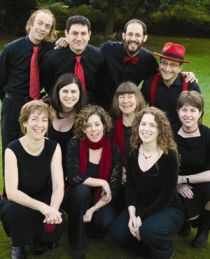 Kol Rina was a Jewish a capella group, which ran for about 10 years from the late 1990s until the mid-2000s. The rest of this page is for historical interest. Kol Rina reinvigorates Jewish music by performing new and inspiring versions of well-loved songs. A ten-piece a capella group based in London, Kol Rina mixes the traditional Hebrew liturgy with accessible and joyful modern melodies. Almost all our songs are original compositions by members of the group. They embrace modern, jazz, reggae and traditional styles with all instrumentation replaced by voices which layer together to create a unique sound. 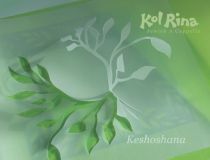 Announcing the launch of our second CD, Keshoshanah. Featuring an eclectic and engaging range of Jewish songs, our second album is released to celebrate the group's tenth anniversary.